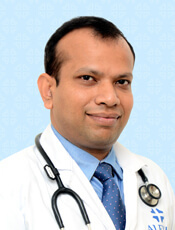 13 years of experience in neurology and treating various neurological diseases including Stroke with thrombolysis, Headache, Vertigo, Dementia, CNS infections, Spine disorders, Movement disorders including Parkinsonâ€™s disease and Botulinum toxin administration. Senior Consultant Neurologist, Wockhardt hospitals, Nagpur (Maharashtra) from October 2008 till August 2018. Neuropathies in Diabetic Patients: The Journal of General Medicine. 2007; 19: 55 â€“ 62. Quality of life in idiopathic Parkinsonâ€™s disease â€“ a study of 51 patients: Abstract in Indian Academy of Neurology (IAN) annual conference, 2007. Toluene induced demyelination: Abstract in IAN annual conference, 2007. Parameters predicting the severity and outcome after stroke â€“ a study of 100 cases: Abstract in Indian Academy of Neurology (IAN) annual conference, 2006. Unusual reversible encephalopathy- A CJD mimic: Abstract in IAN annual conference, 2006. Dolichoectatic vertebrobasilar artery: Abstract IAN annual conference, 2006. Senior Resident- Neurology- Kamineni Hospital LB Nagar Hyderabad. Worked in Institute of choice at NIMHANS, Bengaluru 1/4/14- 30/4/14. Consultant Neurologist Sterling Hospital, Ahmedabad. Kamineni Hospitals, LB Nagar , Hyderabad. National Board of Examinations, New Delhi. Indira Gandhi Government Medical College, Nagpur. Subclinical Mitochondrial dysfunction in Cryptogenic stroke. Int.J. Of Innovative Research Sept 2015. Mitochondrial dysfunction in Mayasthenia gravis- Case series. Indian Journal of Case Reports Sept 2015. Hyponatrimia as initial presenting symptom of Mayasthenia Gravis. Egyptian Journal of Internal Medicine September 2014. Neurological Intensive Care in rural set up- an experience approved for publication in International journal of Basic and Applied Medical Sciences Dec 2015. Post epidural puncture delirium resulting from pneumocephalus - An uncommon presentation. Journal of Neuroanaesthesiology and Critical Care. 2016 - 2018 Consultant Brain & Spine surgeon, Care Hospital & Orange city Hospital Nagpur. 2014 - 2016 Asstt. Prof. & Consultant Neurosurgeon Pt. JNM Medical College & Dr B R Ambedkar Memorial Hospital, Raipur,C.G. 2012 - 2014 Specialist Neurosurgeon, King Abdullah Medical City Makkah,Saudi Arabia. 2008 - 2011 Senior Resident, Dept. of Neurosurgery, SMS Medical College, Jaipur. 2006 - 2008 Senior Resident, Deptt. Of Neurosurgery, Govt. Medical College & Superspeciality Hospital, Nagpur. One Year as Junior Consultant In Fortis Hospital, Mulund, Mumbai. One Year as Associate Consultant in PD Hinduja Hospital & MRC, Mumbai. One Year Assistant Professor in Superspeciality Hospital & GMC, Nagpur. Have participated in few half marathons & have successfully completed them. Participated in 15th Annual Conference of Cerebrovascular Society of India (NEUROVASCON-2015) in Sep 2015 at Ludhiana. Participated in an International Update on Neurointervention (RAIN-2014) organized in Nov 2014 by Shri Ramachandra University, Chennai. Participated in 9th International Workshop on Endoscopic Endonasal Skull Base Surgery April â€“ 2013. Participated in 2nd International Conference on Controversies & Consensus in Neurosurgery organized by Asian Australasian Society of Neurological Surgeons (AASNS) in Feb 2013 at Goa. Participated in Hands on Cadaveric Dissection course organized by World Federation of Skull Base Society in Feb 2013 at Goa. Participated in 61st Annual Conference of Neurological Society of India (NEUROCON-2012) & 1st Indo German Neurosurgical Society (DGNC) Friendship Meeting in Dec 2012 at Delhi. Participated in International Neurosurgery Update 2012 an Academic Programme of the Asian Australasian Society of Neurological Surgeons (AASNS) in June 2012 at Mumbai.